On my radio show, Launch Pad, airing on Sirius XM Channel 132, Business Radio Powered by The Wharton School, I talk with entrepreneurs about their startups. Once a month I choose an Elevator Pitch of the Month. This month my selection is Coravin, founded by Greg Lambrecht. Listen to our in-depth, half-hour conversation here. At Wharton, I teach classes that focus on product design and development. As a “nerdy” engineer, I am fascinated by the how and why of things and cannot help but question the story behind most products. Many products are an improvement on a predecessor, so when a truly novel product hits the marketplace, it causes quite the buzz. This is the case with Coravin, a wine preservation system. The pitch for Coravin is great and there’s lots of appeal for this kind of product. To pour any glass of wine from any bottle without sacrificing quality of the remaining contents is huge, but I’m far more interested in the mechanics that make Coravin possible. The idea for Coravin began as a pet project during Greg’s medical career. Coravin is his first consumer product, a departure from the field of medical device innovation. 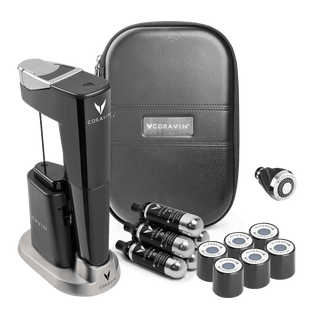 As an avid wine enthusiast, Greg developed Coravin as a convenient way to enjoy his favorite wine without worrying about the deterioration of the wine left in the bottle for too long. “I remember holding this chemotherapy needle in my left hand and a bottle in my right hand thinking, there’s got to be a way I can get the wine I want out of this bottle with this needle,” states Greg. Relying on his background in medical device technology, Greg began experimentation on the wine extraction process. There were definitely some challenges at first, like bypassing the cork. This may sound like a complex system, with the needles and cartridges, but Coravin is actually clever in its design and nimble in its use. The Coravin system, as Greg described it to me, is about one-third the size of a wine bottle. Right before launch, Greg told me he took the “Coravined” wines to the top winemakers in the world to measure the efficacy of the process. He said: “There’s a machine called the FOSS which measures a bunch of different parameters and it showed that the maximum variation from beginning to end of the bottles was within the initial bottle-to-bottle variability.” In layman’s terms, the integrity of the wine remains intact from the first glass to the last, regardless of how much time has passed since the bottle was opened using Coravin. I don’t pretend to be a wine connoisseur but if you appreciate a glass of wine as much as I do, you are probably reaching for your wallet as you read this. The entry-level model of Coravin, marketed for personal use, starts at $199. The Model 11, marketed to restaurants and wine bars, is available for just under $1000.